CNPA: New Concepts in the Arts New concepts of music, theatre, dance and art will be visualized in "CNPA Workshop," a program to be presented by the Center for the New Performing Arts (CNPA) of the University of Iowa Saturday at 8 p.m. in Macbride Auditorium. Tickets will not be required for the program, which will be open to the public. Featuring concepts now being developed in the Center, the workshop will be the first of a series planned for the second semester. Two theatre-oriented pieces will be performed by the CNPA Theatre Ensemble under the direction of Rich Zank, an associate in performance. For "Ex-Othello" Zank adapted a scene from the Shakespeare play for four players extending and rewording the text and the implications of the wordings. 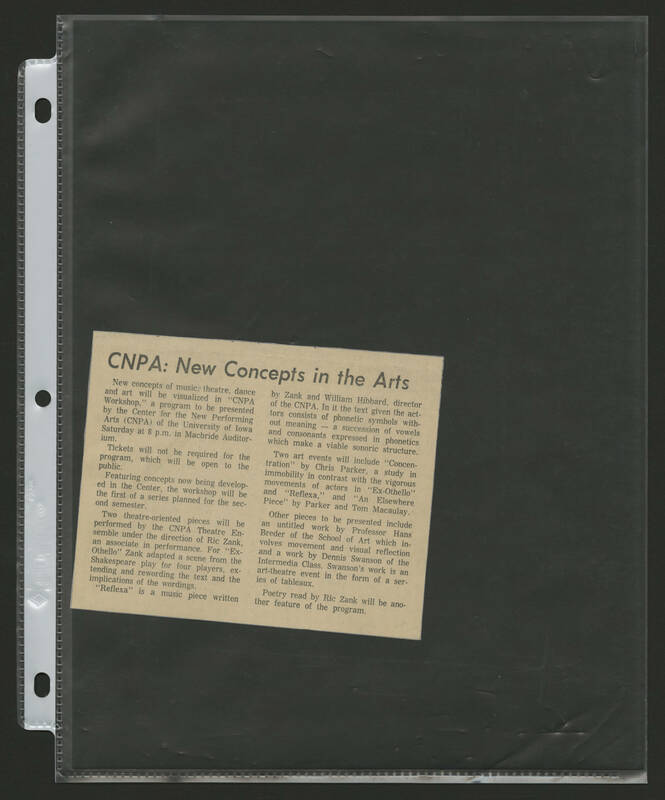 "Reflexa" is a music piece written by Zank and William Hubbard, director of the CNPA. In it the text given the actors consists of phonetic symbols without meaning - a succession of vowels and consonants expressed in phonetics which make a viable sonoric structure. Two art events will include "Concentration" by Chris Parker, a study in immobility in contrast with the vigorous movements of actors in "Ex-Othello" and "Reflexa" and "An Elsewhere Piece" by Parker and Tom Macaulay. Other pieces to be presented include an untitled work by Professor Hans Breder of the School of Art which involves movement and visual reflection and a work by Dennis Swanson of the Intermedia Class. Swanson's work is an art-theatre event in the form of a series of tableaux. Poetry read by Ric Zank will be another feature of the program.